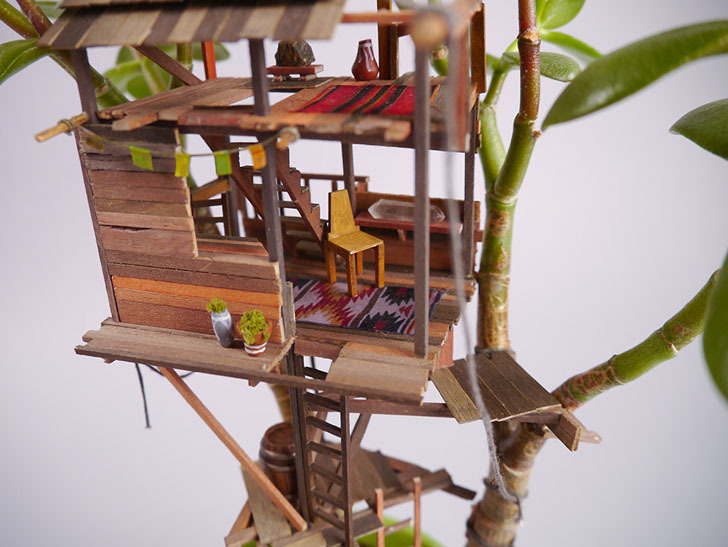 Los Angeles artist Jedediah Cory Voltz’s miniature sculptures transform common houseplants into scenes straight from Swiss Family Robinson. Voltz’s new show at Virgil Normal in LA combines sculpture and foliage to make adorable miniature treehouses with living plants. The series, called Somewhere Small, inspires green thumbs of all ages to get creative with their plants at home! Voltz began his expert model building with skills honed from his years working as a commercial prop designer for film. Having to make structures of all sizes for different shoots, the artist decided to focus on the scaled-down, and to create a new way to view typical plants by challenging perspective. Using fragments of fine fabrics, small pieces of woods, stones, string and even miniature artworks, Voltz has created a village of elevated dioramas. Inspired by architecture found in jungle regions and made from bamboo, his stilted structures feature open-air rooms, tiny wooden ladders, handmade furniture and even miniature paintings hung on the wall. The dollhouse like pieces also double as living air filters. Each carefully structured miniature building snakes around a bonsai tree, jade, or common house plant, using its fragile stems as the base for different levels of each model home. Some of Voltz’s pieces are of simple treehouses, with a tiny tire swing hanging from a branch, while others are more sophisticated, including multiple levels connected by ladders and walkways. The details of Somewhere Small may be achievable only by an expert like Voltz, but the living sculptures can serve as inspiration to bring plant life into your own craft making. Voltz began his expert model building with skills honed from his years working as a commercial prop designer for film. Having to make structures of all sizes for different shoots, the artist decided to focus on the scaled-down, and to create a new way to view typical plants by challenging perspective. Using fragments of fine fabrics, small pieces of woods, stones, string and even miniature art works, Voltz has created a village of elevated dioramas.